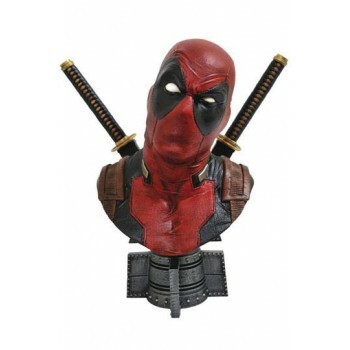 Deadpool has a big mouth, and now that mouth just got a lot bigger! This 1/2 scale bust of the Merc with a Mouth is the biggest we've ever done, measuring approximately 10 inches tall with exacting sculpted details and the highest level of paint applications. Limited to only 1,000 pieces, this hand-numbered resin bust comes with a numbered certificate of authenticity in a full-color, hand-numbered box. Sculpted by Rocco Tartamella!